These phrases seem to be the number 1 thing on any gaming journalists list right now. It seems that the gaming community as a whole has been showing an upheaval to this trend and directing their ire at Electronic Arts (EA) for their treatment of a pay-to-win system implemented in Star Wars Battlefront II. After spending considerable time with the game, I can tell you that the anger is justified. Advancement in a game should not come down to random chance or the ability to purchase a randomly generated card (or any other ridiculous thing implemented in games these days). It is frustrating to know that I have to play for hours to build enough in-game currency to be able to purchase one of these crates, only to get items that will not add anything to the class or character that I choose to play. But is EA to blame for everything? No. They are just the unfortunate company to push the envelope enough to get a backlash. Contrary to what is may seem, Loot Boxes are not a new a new thing and have existed for years in one way or another. Team Fortress 2 has microtransaction’s for different cosmetic items for as long as I can remember. The advent of mobile gaming was the real though of this trend of paying to be able to get better items or to progress further. Think about games like Candy Crush or Clash of Clans, while you can progress without purchasing anything, the games are designed to encourage a purchase to help progress faster. Clash of Clans has actions that take a long time to complete, but the purchase of a coin can speed those actions up. How does this factor into non-mobile games? How did that model get into our Triple A titles? The start was the introduction or free-to-play games. These games cost nothing to start and the use of mircotransactions allow the player to become better or get better items in the game (I’m looking at you World of Tanks). And for the longest time, our games have been offering us the Season Pass, which is a topic for another day. But I think that I have a patient zero when it comes to these trends, the ever popular Overwatch. In it, you can pay for loot boxes to get a random set of cosmetic gear for your characters. I want to emphasize that these do not have any overall impact on the performance of the game and are completely optional. Other games have implemented loot systems or microtransactions before this game, but for me, Overwatch is the game that brought it to the attention of the major publishers. Suddenly games were flooded with options for purchasing crystals or credits to be able to buy crates for gear. These options suddenly popped up in games across all systems to cash in on people wanting to pay more for items or progression. This mentality is gotten to the current trend in gaming, which is where the real problem comes into play. Recent games have locked progression behind paywalls. Progression without purchasing is possible, but it becomes difficult to progress beyond certain areas without tapping into a pay system. Looking at you Shadow of War…. try beating the end game content just by grinding to get new Orcs for your army. 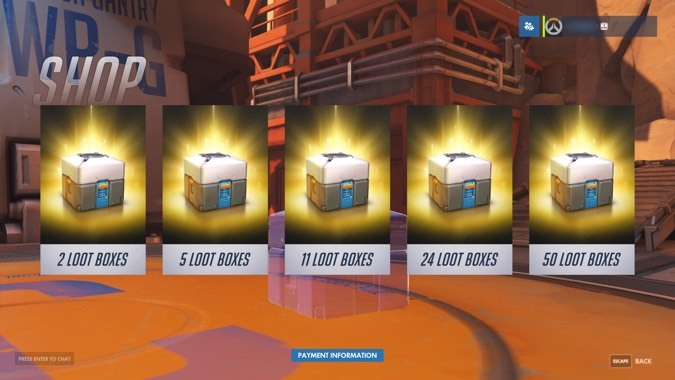 Can Loot Boxes or Microtransactions work? It may sound that I am against the trend of microtansactions, but in reality I am actually for it when done correctly. Look at Titanfall 2, they have microtransactions that only give new skins or cosmetic changes to the game. I mentioned Overwatch before, their system is completely fine in my eyes and has a proven record of making Activision/Blizzard money. I will even go so far as to compliment Ubisoft, who has a record of doing some shady things to get people to spend more. 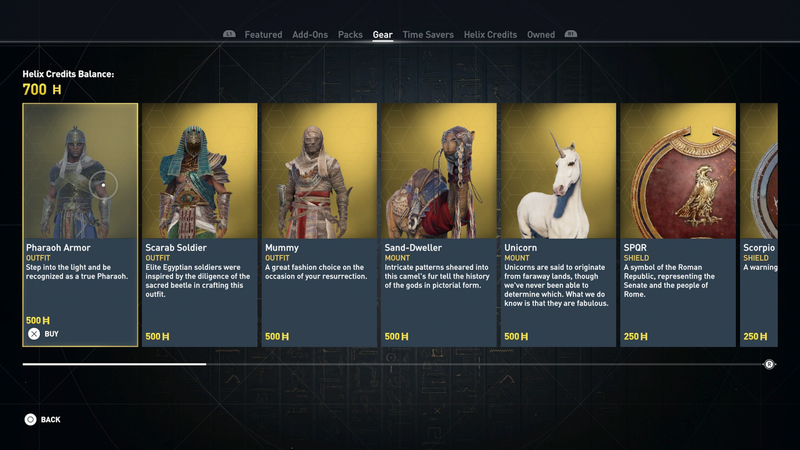 In Assassins Creed Origins, there is an entire storefront that is based upon microtransactions, however, it is mentioned once in the game via a popup and never brought up again. In the game, you are able to progress and get the top level gear without having to spend a single dime in that store. I feel that these options can be set up in the game, as long as they do not impact the gameplay. There are tons of examples that would take too long to list that have done this right and have found a happy medium for the gamers and the company. As I stated before, EA is taking the long overdue backlash from the gaming community. But what did they really do wrong with Battlefront 2? Well, everything really. What gamers were really upset about was that the $60 that they were paying for the game did not actually equal the entirety of the game and it almost forced a player to pay for “crystals” to be able to unlock features in the game they already paid for. Now, all the items that you have the option to pay for are available to unlock via gameplay, but at a rate that was so outrageous it may as well have been taken out (it would take over 40 hours of gameplay to unlock the ability to play as Darth Vader). At the time of release, based on the credits earned per match, a user calculated that it would take the equivalent of around 4,500 hours of gameplay to unlock all of the content in the game that you paid for (for anyone wondering, that is 187 days or half a year of constant playing). The other option was to pay roughly $2,100 to unlock everything. Gamers felt that they were being ripped off by EA to be able to play the game in its entirety. EA implicitly integrated the loot system into the core mechanic of the online play and made it so that the only logical option for a gamer to experience the game was to cough up an absurd amount of money into Battlefront 2. For me, I honestly do not mind the loot system or microtransactions in games, as long as it is not forced upon me or takes away from the experience of the game itself. I think that the games that make this their sole focus lose sight of what games are supposed to be about. As a gamer, the entertainment of the game and the experience is what is most important. I hate going to stores and having to constantly battle off salesmen pandering for me to change to their service or buy something that I don’t need, never taking “NO” for an answer, and I especially don’t want that in games. All gamers want is to be able to enjoy their game and not feel like they are getting the short end of the stick on something they paid their hard earned money for. There is a way for all parties to be happy, these developers just need to be willing to find it and not try to bleed gamers for every penny they can.